February 20, 2017 (PHOENIX, AZ) – Houston-based Boxer Property announced today its acquisition of 3101 N. Central Avenue in Phoenix , AZ on behalf of a third party client. 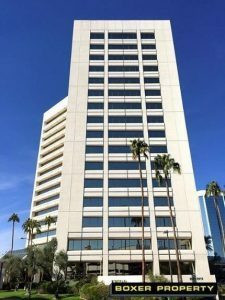 Also known as the CBIZ Plaza, the property totals 248,863 square feet of Class A office space across 16 floors and includes an adjoining 2-story garden office/retail building and a six story parking garage. Built in 1980, a key advantage of 3101 N. Central Avenue is its prime location within Phoenix’s Central Corridor along the Valley Metro Light Rail. The building offers convenient access to Downtown Phoenix and major freeways including I-10 and I-17. The office complex is also located near the Sky Harbor International Airport, which is a 15 minute drive away. The Central Corridor has seen a resurgence in recent years with new restaurants, multifamily development and increased office demand. Having taken over leasing and management duties for LNR Partners in 2015, Boxer implemented their signature, amenity-rich Workstyle executive suites to bring energy and style to the building lobby. Boxer plans to continue to improve the property with exterior tenant space in the breezeway and is in conversations with restaurant and retail operators to bring tenant amenities to the ground floor. Boxer Property is celebrating its 25th year anniversary as an innovative commercial real estate investment and management company that specializes in maximizing the value of under-performing and challenged properties through aggressive leasing and hands-on management. Founded in 1992, Boxer Property Management Corporation is a privately held firm based in Houston that manages, leases, and administers retail, medical, hospitality and office properties with over 17 million square feet across more than 120 locations, nationwide.